Written and directed by Nancy Meyers (It’s Complicated, The Holiday, Something’s Gotta Give, 1998’s The Parent Trap, Father of the Bride I and II, and Private Benjamin), this is a warm, fun, endearing film. Fortunately, Hathaway only rarely spoils it by chewing the scenery a tad too much, but is largely undistracting. 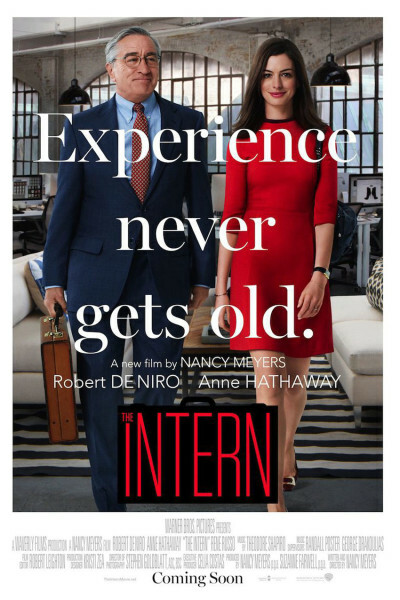 De Niro's character, Ben the intern, is so pure, so well-intentioned. What a refreshing character to see onscreen. A great grandpa or uncle, if you will. I wish we were all this kind and well-meaning. A wonderful date movie, and Lauren loved it to boot, so that's saying something.